ISLAMABAD: Director General Inter-Services Public Relations (ISPR) Major General Asif Ghafoor has warned Pashtun Tahuffuz Movement (PTM) from crossing the limits. "They have three demands; missing persons, reduction in check-posts and clearance of mines. 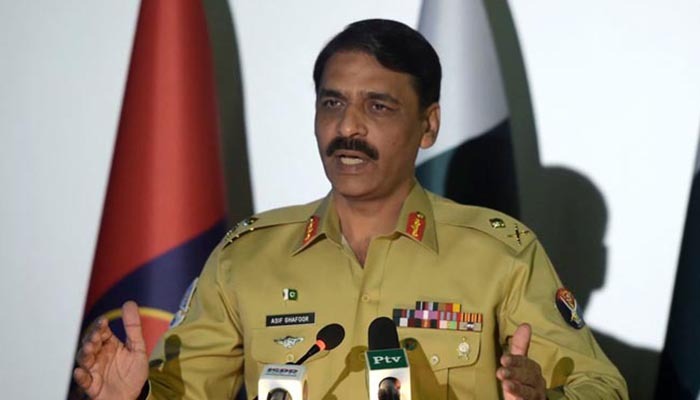 Pakistan Army has reduced number of check posts and with the completion of fence on Pak-Afghan border next year security situation would further improve," DG ISPR addressed the media at GHQ on Thursday. He reminded that Pakistani troops had suffered heavy casualties in the war against terrorism. "Keep it in mind that we have just come out of a war, troops have taken many casualties." He said PTM's initial list carried names of 8,000 to 9000 persons. The army spokesman said out of 7000 cases over 4000 have been resolved. "How can it be proved that those missing are not part of TTP that is holed up in Afghanistan," he asked. "The PTM had no other demands except the three initial ones but they have gone beyond them". He said the army has shown politeness while dealing with PTM keeping in view the fact that the war was fought in their areas. "They are hurt. The DG ISPR warned that the state will use its authority if PTM crosses the line. He said Indian army was deliberately targeting civilian population on Pakistani side of the border. He also referred to propaganda and negativity being spread in India after inauguration of Kartapur Corridor. The military spokesman also showed the map of the proposed corridor which he said the government would complete within six months to facilitate Sikh pilgrims. Talking about wave of terrorism, he said the incident has seen a significant decline in Khyber Paktunkhwa. "Security situation in KP and erstwhile FATA is much better now," he said. He said the killing of civilians in terror incidents has also been reduced all over the country. After achieving relative stability in KP and FATA, he said, the forces have focused their attention on Balohistan, where terrorist incident in have also seen a decline. He said a number of Fararis also gave up arms and renounce militancy. The army chief also invited the disgruntled elements to shun violence and join mainstream. The ISPR DG lauded the Pakistan Rangers Sindh for maintaining peace in Karachi where violence has dropped by 99 percent.